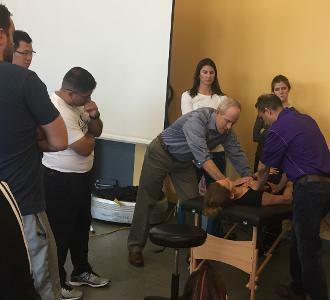 Exo's in Frisco, TX was the location for Postural Respiration last weekend. This course was attended by students from California, New York, New Jersey and especially Texas! Lab assistant James Guzman, PTA, MS, CSCS, PRC came up from Houston and was an essential component to the success of this weekend and enhancing the experience for all students. This class had 1/3 students brand new to PRI ,and for most of the rest participating, this was their first intro to Postural Respiration. The feed-back from the class was that Respiration really reinforced Pelvis and Myokin and reinforced the questions "can a femur adduct, can a ribcage rotate, and can a pelvis and ribcage separate movement to reciprocate and alternate?" These students took the concepts of the didactic material and applied their experience to PRI principles through testing, re-positioning and applying manual techniques. Through the process, they discovered how the PRI principle of lateralization actually occurs and what makes it so important in assessing and providing not only bilateral movement but tri-planer respiratory function as well. As always, Superior T-4 is a hot topic and lab assessment and demonstration helped the entire class discriminate between a patterned LAIC/RBC individual and one that is compensating with scalenes aided by the little muscle the could and will, subclavius. One of the huge take-away's was how Superior T-4 Syndrome affects orientation of a neck and that the bridge from respiration to cervical spine in testing is the Cervical Axial Rotation test. The class got a chance to hear Taylor Lewis MA CSCS, PRT, RKC II discuss PRI applications with Cystic Fibrosis. Thank you Brittani Cookinham, PT for all of your help in hosting this course. And thanks to all of the students, Carmela, Dana, Stephanie, Kelli, Michelle, Mario, TJ, Allison, Stephen, Alexander, Hsuan and everyone else for their spot-on questions and enthusiasm.